Necromancer: Well done my minions. Where ever did you find her? Necromancer: Really? What was she doing in there? Necromancer: Oh my. Hmm, what should we do with her now? Necromancer: Haha! And do what? Necromancer: This is the last time I will say this! Necromancer: ...the undead are NOT able to talk! Necromancer: Kill the intruder, and then bring the girl to the crypt. Necromancer: Excuse me... Sir Wannabe, you will have to find your own. Necromancer: This one is mine. Necro: We have an unexpected guest. Necro: Magically seal the door. Use the orbs to dispel it later. I am going to put her with the others. Necro: Shhh. 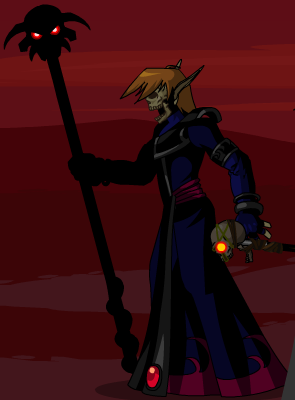 Your would-be hero will make a nice addition to my undead army. Necro: Mwhaha! So do not take him alive! Got that? Necro: Mwahahaha... yelling in here is futile. Necro: By now your hero has been slain and turned into one of my undead troops. Necro: ...requires the blood of a Darkovian Princess! Necro: Shhh... step back, the portal is opening. Necro: I present the Princess of Darkovia! Necro: Impossible, you have magical royal blood in your veins! Necro: Kill... Kill them all! Starting with her!!!! Necro: What else could go wrong today? Stupid Necro Guy: I'm a big stupid head and I catched you! Stupid Necro Guy: You cannot escape my craziness! Necro: YOU! You DARE come back here and disturb my work again? Necro: Your's and your girlfriend's meddling set me back YEARS! Necro: My power has grown, boy, you won't defeat me again. Necro: I told you, child, my power has grown! Necro: I've merged souls from the darkness plane with enough weapons for an army! Necro: HAHAHA! A wave of darkness will sweep over this land! Necro: You are insignificant now. 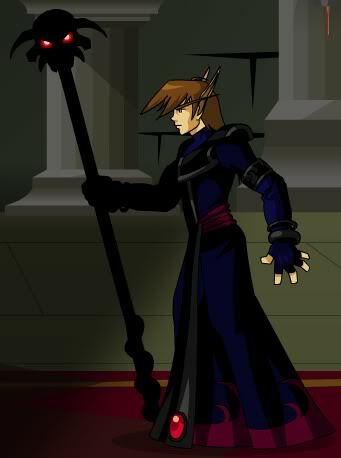 Necro: The only thing that can stop me is the Blade of Destiny, which can only be wielded by a knight! Necro: Now begone, it's time for me to begin raising my army! Necromancer: My plan is almost complete! Nothing can stop me now! Necromancer: The master will teach me the language the darkness and this world will be mine! Necromancer: You're going to need more than the armor to defeat me, commoner. I told you, only the Blade of Destiny can defeat me and you're no Knight. Necromancer: How did a little insignificant squirt like you...actually get a Princess from the plane of light to merge with your sword? Necromancer: I really didn't think I could find a way to hate you more. Necromancer: Ash, there is something I must tell you. Necromancer: Ash, I am your father. Necromancer: Dangit...thought you were one of those orphan heroes with a mysterious unexplained childhood. Necromancer: I told you that two quests ago. Necromancer: Kill you, you little pipsqueak. Now, DIE! Necromancer: Well, we're necromancers... we tend to do that anyways. Necromancer: You're talking too! In case you forgot we're all undead. Necromancer: Die. And join us in darkness! -- Stephen Nix for the image, the AK banner, and corrections. -- Peachii for The Necrotic Generals dialog and images. -- Voodoo Master for dialog, location and coloring.